Birds may not have an inkling that holidays are soon upon us, but they’ll sure love this large seed ornament! The Snowman Feeder promises to be popular among many songbirds, especially finches. 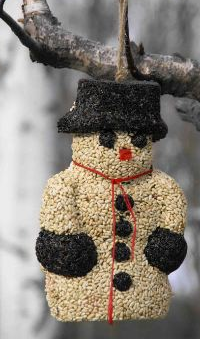 Thistle seed adorns the snowman’s hat, gloves, buttons and eyes, and will be a welcome treat for Goldfinches. Don’t think you have any Goldfinches around right now? Betcha you do, they’re just not yellow this time of year. A dull olive- drab plumage is their coat for winter. You can keep them around with fun finch feeders like these, a thistle feeder or two and a fresh water source (preferably heated). Come summer, that electric yellow plumage will once again grace your yard. Back to Mr. Snowman as a great finch feeder: Simple ingredients like thistle (or nyjer) and chopped peanuts means no fillers, and that means no messy ground waste. House and purple finches will go for chopped peanuts in winter, as will many other resident birds. Peanuts are coveted for their high fat & protein content, extra calories that convert to energy needed to stay warm. Hang some festive cheer in your yard, or give some away as a gift. Connecting with nature during the busy “holidaze” is always a perfect relaxer and de-stresser from all the chaos!